The Empress Bouquet design offers a modern interpretation of 18th-century Chinese print work. The exquisite floral motif with gold and platinum detailing embellishes this Kathryn under-counter sink. Each basin showcases a slightly different variation of the pattern, creating a one-of-a-kind focal point for your bath or powder room. Bring the beauty of the English countryside to your bath or powder room. Inspired by the legacy of English chintz patterns, English Trellis features a light floral design reminiscent of hand-touched engravings. This attractive design graces a Portrait drop-in sink, which displays the soft edges and sculpted lines of French provincial furniture. Tiny bees and butterflies subtly await discovery. Delicate and understated, the Flight of Fancy design on a Caxton under-mount sink lends graceful elegance to the bathroom. A tribute to the time-honored craftsmanship of traditional raised-enamel relief on dinnerware, the intricate floral detailing is framed by thin bands of rich gold. Laureate combines a textured acanthus leaf pattern with a gilded gold-leaf style used by the Ottoman Turks. Popular in the 18th century, the leaf motif was used in embossed fabrics and as an architectural detail. Ringed by a brilliant band of Polished Gold, this Caxton sink lends elegance to your bath or powder room. 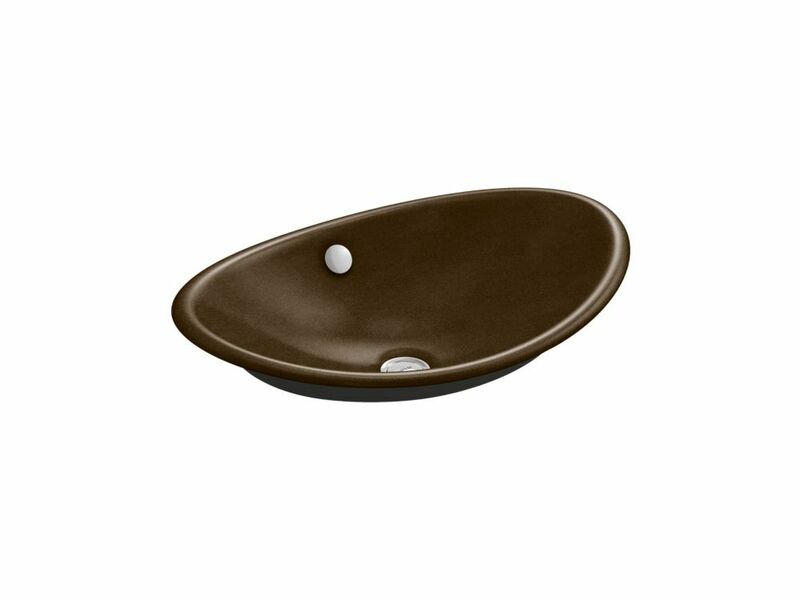 Iron Plains(R) Wading Pool(R) oval bathroom sink with Iron Black painted underside With its gently curved, organic shape, the Iron Plains sink combines distinctive style with the extreme durability, strength, and vintage soul of KOHLER enameled cast iron. This vessel sink features a dual-color design that lets you choose your own combination of top enamel color and underside paint color for the perfect look.